Nikon FE2 Nikkor 50mm f1.4 Kodak Tri-X Kodak HC-110 Dil. 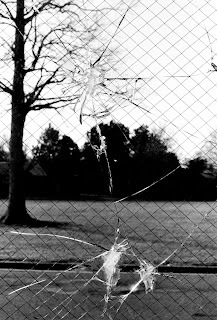 B - In 1984, Pre-Columbine and other famous school shootings, bullet holes in High School's windows did not seem to cause much concern. This was captured at Kecoughtan High School in Hampton VA.. There were usually multiple windows with bullets holes, shots coming from the outside. All appeared overnight, with malice shown for the school itself, not the occupants within.